Once the specialty grains are removed from the wort after steeping for 30 minutes, the heat is turned back on and the wort is brought to a boil. When the wort has reached a boil, the malt extract is added along with the corn sugar from our recipe. These are the sugars that the yeast will consume to create what we call beer. 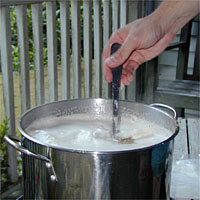 When the sugars have been added, the wort will need to return to a boil. Stirring should be done often. 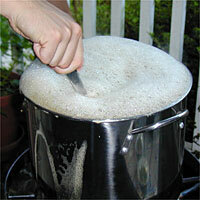 As the wort gets closer to a boil, the potential for boil-over increases. 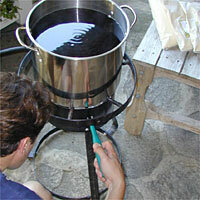 If the wort starts to boil-over, constant stirring will help and it may be necessary to remove it from the heat. 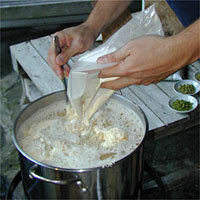 Boil-overs only happen during the first 5 to 10 minutes of the boil. The wort eventually settles into a nice rolling boil. When that happens, you are ready for the next step.